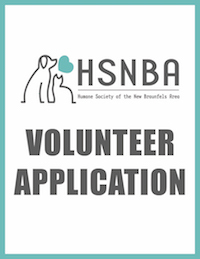 If you’re interested in volunteering, the online application and our opportunities for volunteering, are LOCATED HERE. Trainings are held 2nd Saturday of the month at 4pm and every 4th Wednesday of the month at 6pm HSNBA. As always, you can stop by and visit us or give us a call! We know your time is the most valuable thing you can offer and we are so very grateful. We have something for everyone!